[T]he IOC told The New York Times that women ruled ineligible to compete may opt to medically lower their androgen levels. What a conundrum! Women athletes either walk away from Games they've trained their heart out for, or subject their bodies to potentially risky intervention. If we buy into the IOC's logic, why not go whole hog? Let's test all male athletes, and bar as unfairly advantaged those at the "abnormally high" end of the androgen spectrum. 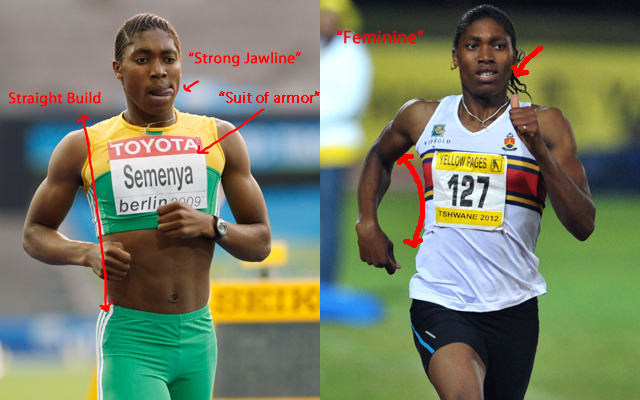 [E]ither due to criticism or because of the new regulations or some other factors, Semenya no longer qualifies as "breathtakingly butch." [The Toronto Star's Stephanie Findlay] describes her as feminine. "She wears a tight turquoise polo over her fit, feminine body. Relaxed, poised and, it must be said, pretty, the young woman with an irresistible smile is almost unrecognizable from photographs taken during the height of the controversy," she writes. And, indeed, her face has gotten rounder, hair longer and figure curvier as you can see [above]. Semenya's performance times also look different. She won that 2009 race with a time of 1:55:45, by a two-second margin. Two weeks ago, she placed eighth in a race with a time of 2:00:07. Past Dish coverage of the Semenya controversy here and here.